It's a cold and rainy Halloween here on the West Coast of Canada, at least where we live it is. I decided to put together a crockpot full of pea soup for dinner. It can simmer all day and be turned to warm to keep while those that trick or treat can come home to a hearty meal whenever they are finished. Again, I don't really use a recipe, so bare with me as I try to figure out what I do to get it all together! Usually I have a ham bone and leftover bits of ham I put in the freezer just for this very meal. For some reason, I seem to have fallen down on that and I had to buy a pork hock to make this batch. I was surprised at how expensive the hock was! It has me thinking that I should just buy 2 large, bone-in hams and make a large amount of soup and freeze it in individual portions. Put water, peas and ham bone in a dutch oven and bring to a boil. Turn off heat and let stand while dicing the onion and grating the carrot. Remove bone from dutch oven to crockpot. Using a slotted spoon, scoop out the peas and add to the crockpot. Add the chopped onion and grated carrot. Pour the liquid from dutch oven to crockpot, keeping any leftover in reserve in case it's needed to be added to the soup. 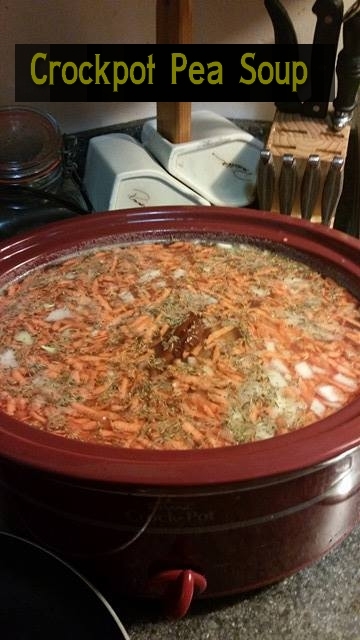 Remove ham bone and pull any meat left on it off and return to crockpot for the last hour. When I use a ham hock, I always buy a large slice of old-fashioned ham from the deli, cube it and add it to the soup for extra meat. Serve it with dinner rolls.